Spanish club, Atletico Madrid will need to pay as much as six million euros if they want goal keeper Thibaut Courtois to play parent club, Chelsea and that is if they are paired to play each other in the Uefa Champions league semi final. Chelsea will be hoping to get Atletico Madrid in Friday’s Champions League semi-final draw after it was revealed the two clubs’ loan agreement could prevent brilliant goalkeeper playing in the game. Atletico president Enrique Cerezo told Spanish radio Onda Cero that 'a large sum of money' would need to be paid by Atletico to Chelsea and that the club 'would be unable to pay'. From what Cerezo said, it is understood that the clause was added in the loan agreement drawn up at the start of the season and could be as much as 3million Euros for each game. Now, Atletico's financial situation makes them reliant on loans and third party investment and the 6m Euro fee would be beyond them. If the clause is confirmed it would deprive Courtois of the biggest game of his career so far as the keeper has being instrumental in making the Madrid club the toughest team to beat in the tournament this season. 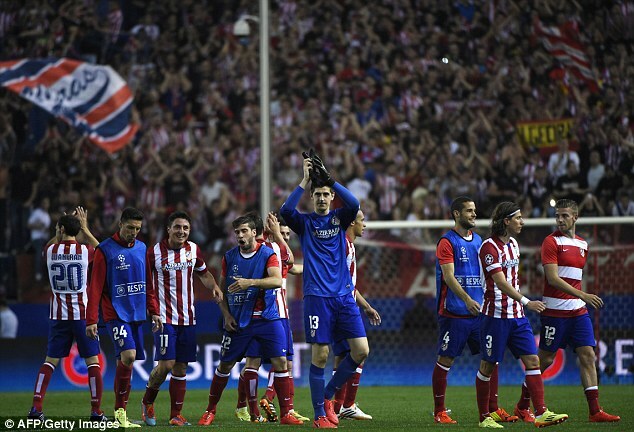 Atletico are the only unbeaten team in the competition and the side who have conceded fewest goals. Barcelona have now played against them five times this season, scoring only twice and are yet to win any of the games. The muddy waters of the loan system have left their mark on the Champions League before. In the 2003-04 season Real Madrid loaned Fernando Morientes to Monaco without a clause to prevent him playing against them. He scored twice in the quarter-finals to help knock Real out and finished top scorer with nine goals as Monaco finished runners-up. Banning a player from playing against another team is not allowed by UEFA but there is nothing to prevent a club putting what is called in Spain, a ‘fear clause’ that means the borrowing club has to pay more if they want the player to play against the lending club. Courtois would be a massive loss to Atletico Madrid. Their second choice keeper is Dani Aranzubia, a 34-year-old former Athletic Bilbao and Deportivo stopper who won the Intertoto cup in 2008. He has neither the match sharpness nor the presence of the 21-year-old Belgian who beaten Barcelona boss Tata Martino, among others, has already labelled 'among the best in the world'.